Lionsgate Presents ‘Snitch’ On 4K Ultra HD in June!!! 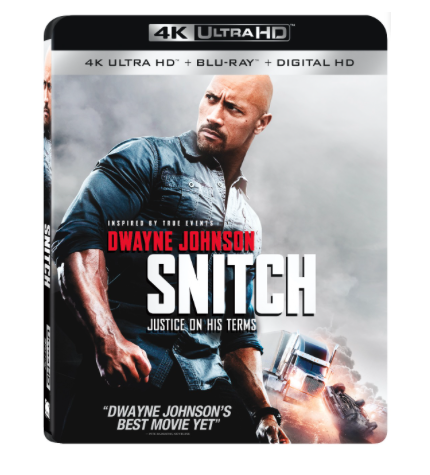 Lionsgate debuts, for the first time, ‘Snitch‘ on 4K Ultra HD Combo Pack June 6. The film stars Dwayne Johnson (‘Moana‘), Barry Pepper (‘Saving Private Ryan‘), Jon Bernthal (‘Fury‘) and Susan Sarandon (‘Thelma & Louise‘) all under the direction of Ric Roman Waugh (‘Felon‘). Johnson stars as a successful businessman who learns his son faces 10 tough years in a federal hole for drug possession. Convinced it was a set-up, he volunteers to become an undercover informant and infiltrate a ruthless cartel. Now, with his back against the wall and his life totally on the line, he must expose the true criminals before they discover his identity. This entry was posted on Monday, March 27th, 2017 at 4:24 pm	and is filed under Film, News. You can follow any responses to this entry through the RSS 2.0 feed. You can skip to the end and leave a response. Pinging is currently not allowed. « ‘Ex Machina’ Debuts On 4K Ultra HD This Summer!!! Thank you, Illinois! The Land of Lincoln!